The Tasu 1 barge is seen in this image from September 2018. QUEEN CHARLOTTE, B.C. 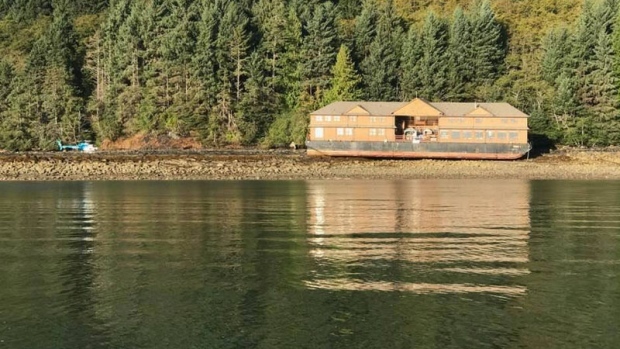 - Booms have been placed around a grounded fishing lodge barge so contaminants that may be seeping from its hull don't foul beaches on the east coast of Haida Gwaii. The council's news release says the booms were placed Thursday while technicians monitoring the barge and surrounding area confirm air inside and around the hull remains unsafe because of harmful vapours. When the barge carrying Westcoast Resorts' Hippa Lodge went aground, there was concern that a possibly ruptured fuel line had filled the hold with potentially explosive vapours.